George Brown, an emigrant from Scotland, arrived in Toronto in 1843 and founded the Globe newspaper the following year. Shortly after his arrival in the colony, he stepped into politics by supporting the reformers, who were campaigning for rep by pop. In 1848, he helped the reformers achieve victory. He was elected to the Legislative Assembly in 1851. 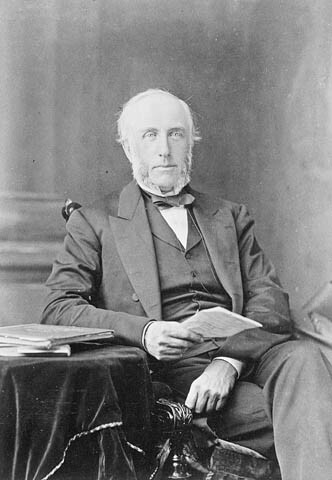 George Brown was a reformer and reorganized the Clear Grit Party in 1857. This party supported representation by population, the separation of church and state and the annexation of the North-Western Territory. It was during these years that Brown developed the idea of a legislative union; with the political instability of the 1860s, he began to promote the concept more and more. In 1864, he proposed the Great Coalition to John A. Macdonald and George-Étienne Cartier, and went on to play a major role at the Charlottetown and Québec Conferences. He resigned from the coalition in 1865. In 1880, a disappointed and frustrated former employee of the Globe shot George Brown in a scuffle at the paper's Toronto offices. The injury to his leg seemed minor enough at first, but an infection developed and subsequently took George Brown's life. Careless, J. M. S. "Brown, George." The 1999 Canadian encyclopedia : world edition. Toronto : McClelland & Stewart, 1998. Careless, J. M. S. "Brown, George." Dictionnaire biographique du Canada. vol. X. Québec : Presses de l'Université Laval, 1972. P. 97-112.